Our hotel room is the bomb. I fell asleep while writing last night and gave up on actually trying to describe it. It’s probably four times the size of our room in Tokyo. There is a front section equipped with a closet and shelving unit, a bathroom with two smaller separate spaces for the toilet and for the shower/bath. We have two small beds and a little sitting area by the window, and a massive tea room separated from the rest of the room by big sliding Japanese doors. We are given lounge kimono-type attire and slippers to wear around the hotel, which dad has taken advantage of, but I have yet to have enough energy at the end of the day to try mine on. The big tea room is my favourite. I sleep through the night and wake up feeling refreshed around 7am. I find Dad having a cup of green tea and sitting in his Japanese lounge wear. He’s been up since 3:30am the poor dear. Breakfast is included in our accommodation, so we have a buffet breakfast at the same lame place we had dinner. It’s not the worst thing in the world, but it’s far from what I would classify as good. Angela meets us at Kyoto Station for 9am and we all take a quick train ride to Fushimi Inari, a famous and very beautiful shrine. Thousands of bright orange toris mark a winding pathway up to the peak of a small forest covered mountain. I’d estimate that takes us about an hour to do the loop from start to finish. The scenery around the pathway is beautiful; covered in mossy thick twisting old trees, and a small river running down the side of the mountain. We also pass a small lake filled with koi fish and turtles. Everything is gorgeous. Somewhere near the bottom half of the shrine there is a kimono stall that Angela tells us she hasn’t seen there before. She guesses it has something to do with the high season for tourists. I find a beautiful pale green cropped kimono-like coat, that isn’t long like a traditional kimono, and to me, seems far more casual. I could see myself wearing this back home as a spring jacket. 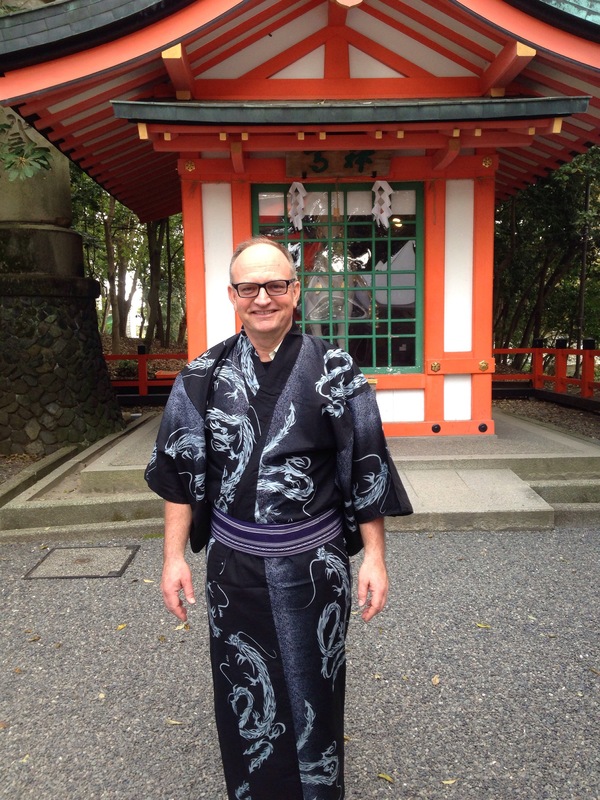 Dad finds a cool dragon printed man kimono and tries it on to see if it would fit as a gift for Sev. The people working at the stall outfit him with all the necessary gear to go along with it, and encourage us to take a picture. Obviously I do. How often does Dad wear dragon printed things? Once we make it all the way down from the shrine, we follow a small side street with a few food stalls lined up against the walls. We choose to try some cool octopus balls, which are small doughy things stuffed with spring onions, cabbage and some other vegetables too. For “dessert” we try something I can only describe as a Japanese waffle. A sweet dough is pressed into a machine to be cooked in the shape of a fish, and is stuffed with green tea flavoured paste. It’s delish. I absolutely love street food, though apparently this is a relatively new phenomenon in Japan. I’m happy that I came at a time when this existed. We take a quick subway to another area of Kyoto (near our hotel) with some shops. For lunch, we stop at a little restaurant that only has one item on the menu. This I can only describe as a Japanese savoury crêpe. It’s filled with like 10 items including what I believe to be shrimp, spring onion, an egg, and 7 other mystery ingredients. After lunch we quickly stop at our hotel room to change because it is WAY hotter than I expected it to be today, and to be honest I’ve done a horrible job of packing. People in Japan dress very modestly for the most part. 50% of my shirt choices are tank tops that my bra straps will hang out of. That’s not ideal. 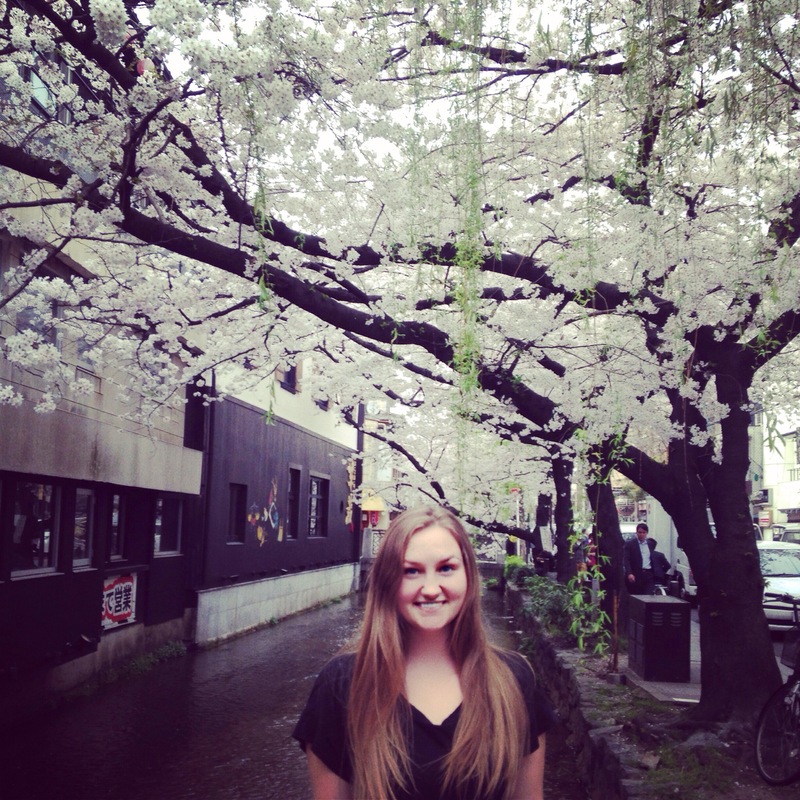 I didn’t think too hard about the casual walking around/site seeing part of Japan. I was only focused on packing for the trek and having clothes for where I’m traveling to next. Whoops. 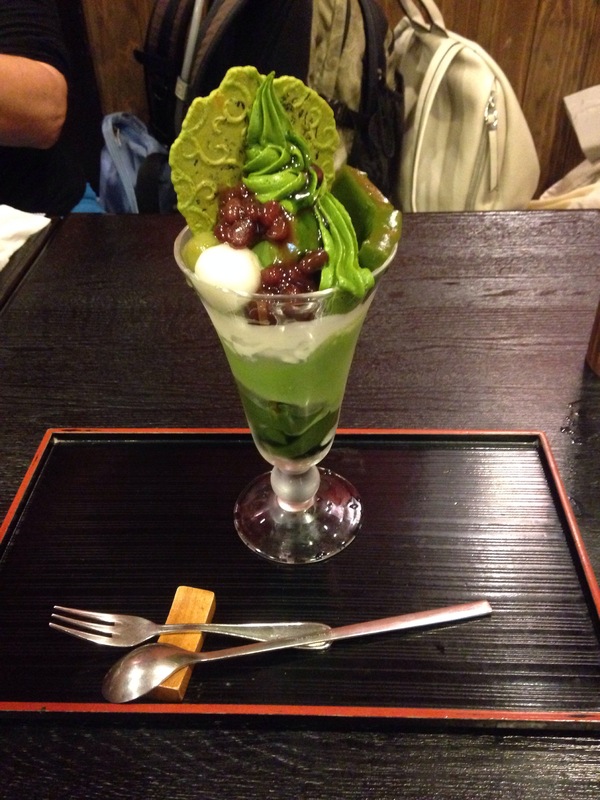 Angela has told us about these green tea parfaits that are very popular in Kyoto. While walking around we come across a little shop that offers them (alongside a billion other matcha-related cookies, cakes, ice creams etc.). We sit down and have a snack. Angela and I order Parfaits while dad orders a straight up matcha. The parfait is extravagant and delicious!! Green tea ice dream layered with matcha jelly, rice balls, beans, and topped with a thin green tea cookie. I can’t eat it all but it’s so awesome. Cherry blossom trees are in full swing today, and will probably be washed away tomorrow by the expected rainfall, so we are lucky to come across the most beautiful place ever; a small river running through a side street of the city that is lined with cherry blossom trees. They’re pretty in pictures but they’re even more fabulous in real life! 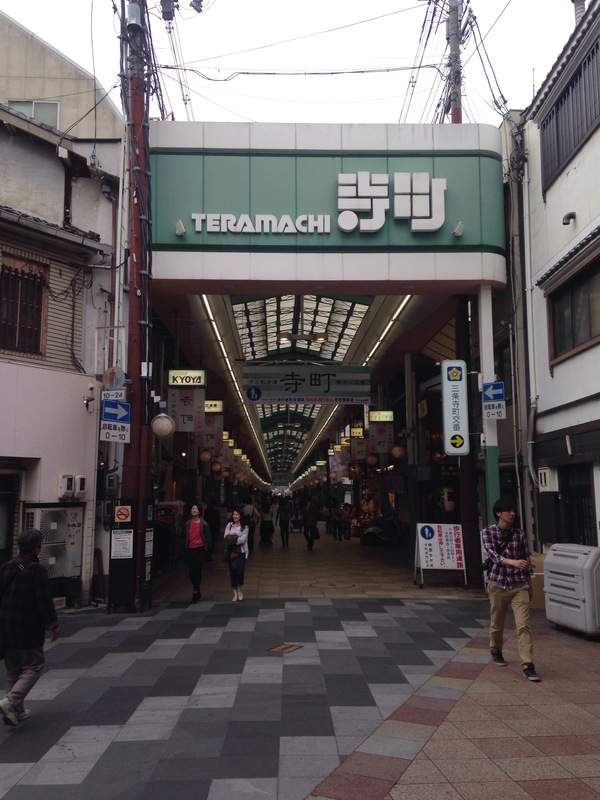 Next, we take a taxi to Teramachi, a fun shopping district downtown. The whole shopping area has been built around a little temple, which we stop at for a few minutes just to check it out. I get a little fortune printed out from a mechanical cow in a box. Did you know there are numerous shops devoted to socks alone? That’s a real thing. People here are all about their socks. 5 toe socks, two-way split socks, fun pattern socks, cat socks…the list goes on. We go in search of an electronic store so dad can get something to transfer his camera photos to his iPad…but no luck. Who would have thought such a technologically advanced society would have a shortage of electronic stores?!! Not I. Dad and I stop for dinner on our way home, and find a cute little basement soba restaurant tucked downstairs on the main strip of shops. I order a soba noodle soup with some spring onions, and Dad gets some tempura, soba noodles, and egg rice bowl. For the first time so far on this trip, I think we’ve finally had our first proper Japanese meal. It’s really yummy! By the time we get back to the hotel again we’re exhausted from another fun-filled day, so I go to bed early in order to be rested for tomorrow’s activities!